Welcome to the Islamorada resort with all the beauty, charm and relaxation that defines the Florida Keys. At Pines & Palms Resort, you can bask in the sun in a hammock or relax poolside or oceanside and enjoy easy access to the open water. We’re located on the Atlantic Ocean at Mile Marker 80.4 in Islamorada in the beautiful Florida Keys. Translated in Spanish to “purple isles”, Islamorada is perhaps best known as the “Sportfishing Capital of the World.” Our Florida Keys resort allows for easy access to activities on or under our waters, which are home to the most unique ecosystem in world. With all of our Islamorada accommodations featuring a full kitchen, you can dine in or cook your catch to really live like a ‘local’ on your vacation. If you appreciate the laid-back lifestyle of the Keys, then you’ll fit right in. Enjoy our quiet, tropical, village-like setting amid tall, graceful palms and a backdrop of bright blue waters. At Pines & Palms Resort, we have Islamorada accommodations to fit any family or group. We have oceanfront cottages and suites with one, two and three bedrooms. Our heated freshwater pool and tiki bar is just inches off the Atlantic, and if you bring a boat, we provide free dockage and ramp usage. 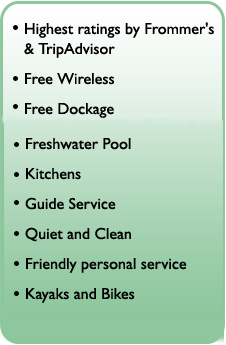 Book activities for your Islamorada vacation, including fishing and dining, with our helpful front desk professionals. Our Islamorada resort is just what you’ve hoped for – but don’t just take our word – read our reviews on Frommer’s and TripAdvisor. We look forward to welcoming you at Pines & Palms Resort soon!